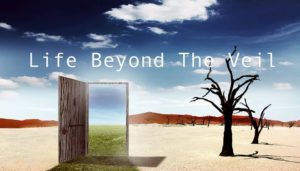 In less than an hour I will be a guest of my friend and Medium Extraordinaire, Pamela Aaralyn on her live Spreecast event to talk about all things that happen beyond physical death. The “veil” really is thinning for all of us! There is so much to talk about. The date of the show is April 28, 2016 at 10am MT, 11am CT and it will be a live event but recorded. Click the link below to listen live or to the archived version. Last night my house was filled to the brim with excited spirits and my dreams were also focused on the subject. I am not “normally” aware of these kinds of spirits, but holy moly, it was like a party at my house! I was dreaming of a woman who was teaching or instructing how to communicate with our departed loved ones and others when a painting (of Metatron’s cube) fell off the wall in my real “physical” home and awoke me from the dream. But laying there, the dream didn’t end, it simply layered itself over my waking state. Even sitting up. Even with the light on. I went out to see what had crashed in the other room and by then was quite awake. I opened my computer, mostly just to see what time it was, and noticed a new communication from my friend Kathleen McGowan on her “Life Conquers Death” facebook page. 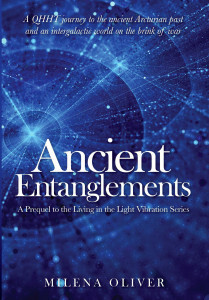 It was the introduction of a newly published book on Orbs by Nancy Myers- one that focuses on life after life, just the subject we will discuss today! I plan on reading and reviewing her book soon. I found myself sending Nancy a message and noted the time, 3:33am. Its going to be a fascinating program today. I hope you join us! Permission to share this blog freely given, as long as it remains complete with all links attached. Copyright Candace Craw-Goldman 2016. 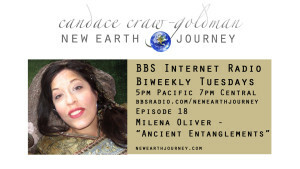 Milena will join me on New Earth Journey Radio March 15, 2016 at 7m Central Time. All shows are archived on BBS Radio, Itunes and YouTube. It’s been quite the year, 2015. And yet, as transformative as the rest of the year has been, and even in the midst of global, community and even personal uncertainty, the Christmas season brings with it gifts of the comfort of the familiar. Jesus Christ, Jeshua, Easa, the Christ Consciousness…. make appearances in QHHT Sessions sometimes in surprising ways. In this Quantum Healing with Candace episode Candace talks about Dolores’ two Jesus books and then reads three “Jesus” QHHT stories from her own practice to celebrate Christmas! In the first story- a man finds himself worthy and reclaims his love for not only Jesus, but for his wife and marriage. In the second story we find out that Jesus has a sense of humor and a great sense of timing too! In the third and final story we hear an amazing Christmas story from one of the actual participants of the Nativity itself! Dolores Cannon with her brass cardinal bell. As someone who works in this world of consciousness exploration daily, I can honestly say that when I think about how humans are changing and evolving, I think about my friend Heather. I think about her experience and what she has learned, and what she so effectively, and sometimes quite humorously, teaches and inspires in others is exactly this connection with the greater aspect of ourselves that we are all moving toward as we evolve as a species. Heather is just able to help you put a turbo booster on getting to that place sooner, and perhaps with less effort or confusion! You really can learn how to have consistent and reliable communication with your Higher Self! As a reminder, even if the class is not right for you, or perhaps just not right at this time, I want to remind all of my New Earth Journey readers and listeners to New Earth Journey BBS Radio that Heather is offering a 25% off discount on personal coaching calls through the end of 2015. Thanks for being so generous Heather. You just rock. It was a brilliantly clear, dark and starry sky the early morning I left to drive to northwest Arkansas for Dolores Cannon’s Past Life Regression class. I remember standing on our driveway mentally going over what I would need for the next five days. I was pretty sure I had packed everything necessary. I opened the back door of the pickup truck and tossed in my backpack. That’s when time slowed. Waaaaaaaay down. I watched the backpack leave my hands and arc into the back seat in extremely slow motion. As it inched slowly through midair I imagined the drive. I watched mile after mile of highway pass through the windows. I saw myself drinking coffee and putting fuel in the tank and divining the gas stations with the cleanest restrooms along the way. I felt myself standing at the hotel desk checking in, I heard the key release the lock of the room in which I would stay. I felt the stiff sheets of the springy bed with their faint chlorine smell and then saw the steam waft up from some random baked chicken lunch served banquet style for the group. I felt my hands pull on my sweater more tightly against the chilly air-conditioned classroom as I heard the sounds of paper rustling and the gentle clearing of one or two throats nearby. I watched a woman with presence get up from her chair in the front of the room and begin to walk towards me. And then I heard Dolores Cannon’s voice as clear as a bell in my head. Thump. The backpack landed in a heap on the backseat. I did not move. I think I was holding my breath. Whoa. I mean WHOA. The “pre” story to how it was even possible for me to be standing in the driveway about to turn the ignition to begin this trip and journey was filled with magic and miraculous and nearly unbelievable events. Apparently, they were not yet over. I wasn’t able to move for a minute or two as I contemplated the scenes and especially the words in my head and the message I just received. I thought of little else the 9 hours it took to get to Fayetteville. 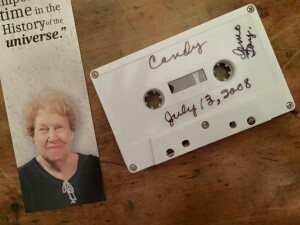 I knew that Dolores Cannon was going to do a demonstration of her Past Life Regression technique for the class of those who gathered there to learn the method for themselves. I also knew she likely would be choosing that lucky person from the students taking the class and without the slightest shadow of a doubt knew that subject was going to be me. 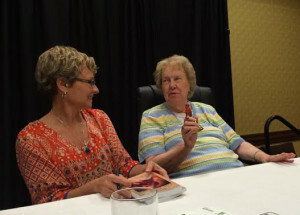 When I got to Arkansas and began to get to know my classmates I quickly learned that nearly everyone there was hoping to be chosen as the demonstration subject. Well of course they were. At the time Dolores’ waiting list for personal sessions was over a year. I immediately burst into tears. “Yes, Dolores, of course, I would be honored.” I remember the face of the gal who sat next to me. My roommate, who very much wanted that honor and had asked for it, and had known that I did not. “Surprise” didn’t quite measure up to describing her reaction. I barely slept that night I was so nervous and excited. What kind of past life would I have? Would I recall some sort of horrible life? What if I learned I had been a cruel dictator or had killed another human? The “what ifs” continued all night long. I prayed to my angels to comfort me, to guide me and to promise not to leave me for even one moment. I finally gave up sleeping at about 4am and got showered and dressed. I spent the next couple of hours walking the hotel which was the Holiday Inn in Fayetteville off of Interstate 49. This hotel has an indoor pool and I just walked and walked around the lobby and pool area while my thoughts marinated in the smell of chlorine. Finally it was time for breakfast. I met my classmates for coffee and watched the others eat the hotel food that I was too nervous to attempt to eat myself. Everyone there was so kind about my upcoming adventure. The last minutes ticked by slowly. As we gathered in the ballroom the tables were pushed towards the back of the room and the chairs were gathered around Dolores’ table and a rollaway bed was brought in for me to lay on during the session. Oh my that bed! It is a big detail in my memory of the whole experience. It was ancient. It was squeaky and the springs were big and poked through the cheap and well used flattened mattress. Quite frankly, it was awful and extremely uncomfortable. As everyone was getting ready and Dolores was getting her equipment set up, she looked over and smiled, “Are you comfortable?” Dang. No, I actually was not. I settled for the honest answer of “I’m trying to be comfortable.” I found if I tried to lay on the upslope of the mattress which was flattened in the middle I could keep most of the springs out of my back, but if my weight moved to the middle I would be rudely poked. I wondered if this bed would ruin my whole experience! At this point I had a couple of classmates walk up to me and squat and whisper words of encouragement and more. One lovely woman, a friend to this day, suggested I focus on my pineal gland or 3rd eye during the induction and gave me a hug and kiss for good luck. Another lovely very psychic soul came to me with wide eyes and hushed tones what she was currently witnessing in the room. I will forever be grateful for the sharing of that information, it was indeed comforting, but it did not ease my nervousness! It actually made me even more wide-eyed and alert. I was about to be regressed by the world’s most experienced past life regressionist, I was apparently surrounded by giant angels and there was an audience of about 30 people gathered to see what would happen during the session. I seriously felt like I had just had one or two shots of espresso, and it did not seem, at the time, at all likely that I was about to enter a deep state of relaxation. But of course that is exactly what happened. Cassette from my Dolores Cannon PLR. Finally everyone was settled and we were ready to begin. I took a deep breath. I knew that my life was about to change. And I was right. In the first part of Dolores’ induction she asks you to “see a red bird” which is how and why our dear teacher is so often associated with red birds, and especially cardinals. She gets the client’s visual part of the brain working and then begins to have them relax and let go. Very quickly, my heart began to slow down, tension flowed out of my body and my arms and legs began to feel heavy. As Dolores talked on, I became more and more relaxed. My mind became more and more focused and sort of just floated there expectantly, taking it all in. Curiously, or perhaps not, actually, my conscious awareness never left me. I knew at all times, that I had a physical body that was laying on an ancient rollaway bed in a ballroom in Fayetteville Arkansas, experiencing a regression session, even while I was taken to a very vivid past life experience. This is rather an important point when one talks about Dolores Cannon and her method, and one I explore in more detail with my own clients. Being hypnotized, even deeply so, does not at all mean the same thing as being under anesthesia. Certainly some individuals experience clinical somnambulism, the sleepwalking state where little to nothing is recalled afterwards, but that percentage of people is actually quite small. Dolores did quite often say she took her clients to that state: somnambulism, but in time explained that her definition and the scientific and clinical one did not match completely. In Dolores Cannon’s definition of somnambulism, the client sees and feels everything as if they were actually there. They can smell, touch, taste and feel deep emotional states as if they were actually in that life, that body, that place. She stated that whether or not one recalled all the details afterward did not change her definition. And for many people the details do fade, just like a dream, even if they recall every bit of it at the time. So something like a movie, or a detailed daydream began to transpire. It started with two Archangels, Michael and Raphael. With AA Michael on my left and AA Raphael on my right they picked up my elbows, and escorted me. At first I saw nothing at all, just felt movement. I even giggle a little bit at this point. I felt we were moving towards my left. This was funny to me because one of the primary goals of the session was to discover and heal the source of my physical body pain which was almost completely focused upon my left side. Then it felt as if we were going down towards the planet. They landed me safely on the ground, slowly and gently backed away from me and then just disappeared. I was left standing just a few feet from a red rocky face of a hill. Now, at the same time I felt myself becoming more and more sure about what was happening in my past life experience I was also very much aware of laying on the rollaway bed in the hotel room. As a matter of fact I seemed to be hyper-aware of both places. I could hear clicks of ballpoint pens. I could hear paper rustling. One quite memorable moment I heard the doors open at the back of the room. Apparently, the hotel staff was bringing in more coffee or tea or something for the refreshment table. I felt the entire room turn toward the door and most of class wave their arms in unison as if to say, “please go.” I really heard and felt that arm wave. Yet I was laying down, had my eyes closed and I was also in another world. Dolores was asking about my cave and I was telling her I lived there. She asked, “Well if you live here there is nothing to be afraid of, is there?” and I said, quite loudly,”There is always something to be afraid of!” I began to feel the extreme emotions of the caveman. Dolores continued to ask questions and I began to learn about myself as I answered them. I lived alone. I ate mostly fruit from the big trees but sometimes I ate small animals. I had a fire and I did cook meat but sometimes I was too hungry to wait to cook the meat through. My life was very basic. Eat and try not to be eaten. I had to be very careful about the animals outside who wanted to eat me. My days consisted of staying as safe as possible, usually in the cave, until I was too hungry and weak to stay much longer and I would have to go out to eat. I think there was a season for fruits but when the weather changed the main food was animals. The days where I would be unsuccessful in hunting and I would come back to the cave even weaker and my stomach hurt a lot from hunger. There were “others like me” nearby but I was ostracized. One of the reasons was that I was the “wrong” color. Most of the others were dark brown in color. I was quite red and that made me very suspect. I also had “ideas” about how to try to trap or catch animals that which the other cave people did not understand nor approve. I lived alone because I looked different and I thought about solving problems in a different way that was not accepted by the others. At this point I began crying. My stomach hurt. My actual stomach laying in the ballroom hurt and my caveman stomach too. I was crying not only because my stomach hurt but because of the sometimes difficult job of simple survival. I very much was feeling the emotional state of that man in the cave. The next thing that happened in the session is that Dolores moved me to “an important day,” and that day ended up to be the day of my death. I found myself on a narrow ledge with a steep drop to the bottom of a canyon. I was being chased there, and at first I was not sure by what or whom. I was wishing I had my “stick and vine” tool to help me get out of that pinch. I mentioned how the other beings thought me stupid to use these “tools” I was shown again how different I was, and why I did not fit in…Dolores tells me how she thinks the other ones are stupid because they don’t listen to how things might be done more effectively and efficiently. It was then that the other people showed up on the ledge too. There was a group of them, many carrying spears, which were really just pointed sticks. They were walking toward me, pointing their sticks in a menacing way. They wanted me to jump off the ledge and kill myself. “Why do they want to do that?” Dolores asked. “Because I am trouble.” I answered, plus, they wanted to take my cave for themselves. They wanted me to jump because it was easier for them for me to kill myself than for them to do it themselves, but I would not give them the easy way out. “They are going to have to kill me,” I said. I remember looking at one very young boy at the back of the group. Meeting his eyes. He was being taught to hate and kill that which was not accepted as normal. They were encouraging this very young child to join them in stabbing me. The vision of the young boy made me infinitely sad. My life was only about trying to suggest ways to improve life for everyone, but the narrow-mindedness and petty egos of the others were unable to embrace new ways of thinking. Me, and my new ideas were being extinguished with violence, hatred and above all – fear. They stabbed me with sharp sticks until I fell off the ledge. My consciousness left the caveman body even before it hit the floor of the canyon. Dolores asked me if I could see it. I said, “Yes, it’s on the ground near the water.” I almost chuckled at this point. “Well, someone is going to eat today.” I peered at the broken and lifeless form below. Dolores was asking me about the people who killed me. “How do you feel about what they did?” I told her I felt sorry for them. “You are not angry?” I told her they were not evolved. They did not have the capacity for growing and learning. They just were not ready. Dolores then asked about my life’s lesson and purpose. I told her I would not fight, I would not be ignorant like the others, even if I had to die early. I would follow my heart and my truth, try to help others and accept myself as being different. I tried my very best to co-exist with the unevolved others and help them. The theme for that life is one I have focused on for many lifetimes including this one! Happily I have many friends and family who fully support me in my current life and are quite highly evolved humans. I remember the answer and information then being…somewhat censored and simplified and even narrowed. My SC did say that it had to do with the time we were in, the energetics of the planet and my particular physical form that was so sensitive that is was being affected far more than other bodies. Also that it was very new information and not quite ready to be released. I am only now, more than seven years later beginning to understand just exactly what that means. I was told I almost always picked very hard lives and that I am “progressing rapidly.” My SC told me to spend more time outside- more time with my horses and to stop working so hard. I have to smile as I write that. I am still very busy, in some ways busier than ever. That advice, I am sure, remains applicable to today! I was supposed to help with the transition of humankind. Both into the new vibratory levels of the New Earth and also with those who leave their physicality and pass into the next plane of existence. “After death communication” and expressing the “beauty” that can and does exist in death was emphasized. 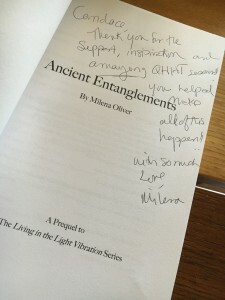 I was told to create all manner of projects to assist with these concepts and to continue to write, write, write. And that was the end of the session. One of the first things Dolores asked me when I sat up was if I remembered anything. I said, “Yes. I remember it all.” She laughed and said, I probably just thought that I did, but I did in fact remember every bit of what happened. Now, she was correct that some of the details did begin to fade, but for me that was not for a long while. By the time I received my cassette in the mail, however, I had forgotten quite a few small details and some bigger ones too. So, did the session change my life? Absolutely. My body pain did not disappear immediately, but I found myself more comfortable very soon indeed and by the time 4 months or so had passed, and I was on my new path practicing Dolores’ method with others, and also asking for SC assistance, I did improve and soon the all-over pain that used to plague my every waking day, simply vanished. I have been practicing Dolores’ method of Past Life Regression now called Quantum Healing Hypnosis (QHHT) for more than 7 years. 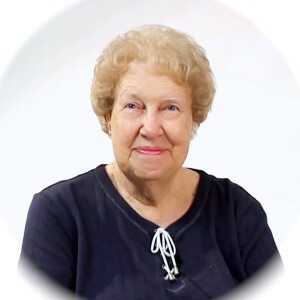 Dolores gave me permission to create and manage her official and professional online support Forum for all practitioners in December of 2008 and I continue to do so even to this day. We have helped countless other practitioners all around the world. Before her death in late 2014, I was blessed and honored to assist her teaching in her live QHHT classes in Arkansas for several years. The amazing thing about Dolores Cannon is that even though she is not physical in our 3rd dimension, she is more alive than ever in the world of QHHT! She makes herself known to practitioners, students, clients and even her fans in sessions, intuitions, dreams and more and she is still teaching her method via video tape online. And wouldn’t you know that she would? After nearly 50 years of communicating across time and space with countless people and other beings from the past and future and other worlds, she remains a Master teacher and in communication with those who are still here on the planet and still hard at work uncovering lost knowledge and discovering new knowledge and assisting others to recover their health and create happiness and learn their purpose in life. I am honored to be one of the thousands of living legacies to her work. I am also proud to announce the creation of yet another new project to help assist humans in this rapidly changing world of transition! Debuting this coming Friday, September 18 on the In5d.com radio network will be a brand new show that will have its very foundation based upon Dolores Cannon’s work and discoveries. Quantum Healing with Candace will focus on humankind’s new understanding and acceptance of the Quantum world and the role that consciousness plays in shaping both our individual and collective reality. Guests will include friends and colleagues, QHHT Practitioners from around the world who will share their stories of miraculous healings and convoluted information. We will also broaden our understanding of this infinitely fascinating subject by talking with others such as healers, shaman, clergy, authors, teachers, scientists, medical professionals and more! Please join us. The term keeps running through my head. The Urban Dictionary defines the professional victim as: Someone who (usually falsely) claims victimization any time things don’t go their way. Everywhere this person goes, they believe someone is taking advantage of them. This person has many many stories of The Man keeping them down, numerous abuse incidents throughout their childhood and adolescence and adulthood. This person will regale you with stories of their failures as a result of someone other than themselves. It’s never their fault, in whole or in part. Life just isn’t fair for these people. Thank goodness I have very few professional victims (PVs) in my life. Happily my personal life and circumstance just naturally are not a match to this type of energy. Rarely I might have a client who may be described this way, but most people who can be described as PV’s usually don’t seek self-help modalities such as QHHT (Quantum Healing Hypnosis), because of course, everything that is wrong in their world, they perceive as the fault of others. Matt Kahn has a great video out where he talks about this. That last paragraph is pure gold. There are two very powerful concepts here to not only understand on an intellectual level but to align with and form and manifest your world proactively with these ideas in mind. “…you have to learn to energetically hold your vibration.” This is not always easy, but it is extremely important. If you can hold your higher vibration, if you can remember that you are not defined by another person’s opinion or reaction, you will not be affected by other people’s ridiculous rants or drama. According to Matt, this is an energetic “game” that humans play every single day. The PV has some well developed and confident energetic muscles. Heart-centered people, in general, haven’t fully grasped what it means to be confident energetically like this when confronted with extreme negativity. There are strategies that can diffuse the situation, but usually trying to change the PV on the spot is not going to work. Keeping your heart centered confidence and energy high and strong is possible. It takes some practice, but it can be done. The last few words in that paragraph explain so brilliantly what is going on when you are faced with a PV. “ …the world you see that you’re afraid of is only as scary as your ability to be shut down by their powerful energy of negativity.” The PVs in the world are extremely powerful. Those who are awakened are particularly aware of their energy because the simple fact that one is awake allows one to see and sense all kinds of energy! You can feel the power in their insults and judgements. I’ve always loved the old Polish proverb “Not my circus, not my monkeys.” It helps one to remember not to align with or accept into your field or fuel the negative energy of PVs. It doesn’t help them for you to do so, and it certainly will not be helpful for you or your life. Arguing with or trying to change PVs almost always backfires and escalates the situation. Matt suggests a couple of surprising responses in his full video below. I highly recommend you take the time to listen. Remember that change always comes from the inside and angry and hurt people do not really become aware of their PV behavior until they after they are healed from it. Your considered, strong and confident heart based response to PVs can help to break the cycle of abuse and victimhood, and actually raise your own vibration as you do this. Matt explains how below. This information is from Wendy Kennedy of Higher Frequencies. As we mentioned last week, we will be sharing Light Codes to assist you with the upcoming energies of authority, control, and competition as you near the equinox and begin integrating these Orion archetypes. This week we focus on control. Once again, to work with the codes, we suggest sitting quietly with them several times a week or as you feel called to. The Orions spent many eons locked in the illusion of control. To move beyond it, it took the willingness of a brave and courageous few to step outside the norm, trusting in what their hearts and intuition were guiding them to do; relinquish the need for control. Control can be obvious, or it can be one of the more subtle programs you all play out in your lives. It can come in many forms. As you gaze upon the code, acknowledge the places in your life that you are currently exerting control. Do you seek to control how things manifest in your life and what form they take? Often times you may have a very fixed idea of what something is supposed to look like in your mind, only to miss an opportunity to experience the same vibrational essence in another form. Do you try to control time? Many of you may feel you have to do things in a certain order and within a particular time frame. The universe seeks to support you in the most effective and efficient way possible. The manner and time frame in which this is accomplished may look very different to the ego’s schedule, which is rarely highly effective or efficient. Are you seeking to control others, their beliefs or emotions? You may present information in a very controlled manor to illicit a particular response from another so that you may feel love, approval, safety, security or connection. Are you trying to control a loved one’s behavior? You may seek to do so because you are projecting your own fears onto their potential experience. As you continue to gaze upon the code, imagine a feeling of alignment and connection to the following:Allowance, Inherent Safety & Security, Divine Knowing, and Trust. A couple of Saturdays ago, first thing after waking up, I walked into our kitchen and told my husband Tom that I had an interesting dream I wanted to share. As I made coffee and as he began preparing the dogs’ and cats’ breakfast dishes I began to tell him about it. In the dream I was in my parents’ home walking through their kitchen. Mid stride, without any warning or preparation I felt a contraction in my uterus. It was not painful but it was strong and as a mother of two children it was a very familiar sensation. I was about to give birth! Immediately I felt something exit the birth canal of my body. I stopped, reached down and caught a small warm form near my knees before it could hit the floor. I looked down as I lifted up the warm, moving being to see…a kitten! What? I was so surprised. It was not a newborn kitten but certainly also not a full grown cat. She was gorgeous. She had long hair and was multicolored in a way beyond what a calico cat or any colored cat I have ever known. She had white ears and tufts on the tips that immediately made me think of antennae. Her eyes were green, the same exact shade of green of my own and she held my gaze in a very deep way. I simply stood in the kitchen, and stared at her in wonder and surprise. Now anyone who knows me knows I am always creating! I am in the middle of many creative projects at any given time so exactly to what was being referred, I really did not know. What I did know what how the feeling of excitement and LOVE stayed with me. I do truly adore cats and the lovely multicolored feline seemed to just remain in my thoughts. And just like that, it all came together. I was in my parent’s home, just in the middle of my workaday world, when something amazing was born and surprised the heck out of me. I was thrilled enough to have Michelle be a guest on my own little show, let alone be asked to join the In5d family of writers and radio show hosts, but I readily accepted. Michelle Walling and Gregg Prescott of In5D have always been great supporters of the late Dolores Cannon, and I have been interested in preserving Dolores’ legacy and supporting all of those practitioners of QHHT (Quantum Healing Hypnosis) who carry on with the Cannon Method since my own first class back in 2008. “Quantum Healing with Candace” will debut September 18. The show will have its foundation in the work and method of Dolores Cannon. There are thousands of practitioners around the world who are facilitating amazing sessions of healing and consciousness exploration…there are endless stories to bring to the show and many friends and colleagues to ask to join me. But there are others who are also working in this “Quantum” world who will help round out future show topics. More and more traditionally trained science and medical professionals including doctors, nurses, dentists, veterinarians and researchers are beginning to come on board with the idea of consciousness based healing. They have wonderful stories and information to share as well. And isn’t it about time that they do?! I still have that kitten on my mind. Not only was it born in my parent’s home, there are other symbolic references that I find compelling. First of all it was a kitten. I am pretty passionate about animals but particularly felines. So she represents passion. She was not newborn, but she was not an adult either. This to me means that as far as radio goes, I am not a newbie for sure, but I have not yet reached the adulthood of my potential on the airwaves. The kitten was female. I am female and we are all aware of the Divine Feminine returning and needing a voice. Her eyes were green, the same green as my own. She was a part of me. 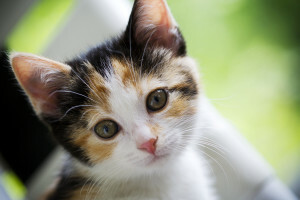 The little ears of the kitten, were white, a neutral color, perhaps indicating neutral listening, and the tufts on them really looked like antennae, which of course relates to the idea of radio. The multi-colored coat of the kitten to me represents other people, other cultures and other ideas. I envision “Quantum Healing with Candace” to present deep thinkers, writers, researchers, teachers and my own friends, and colleagues, both those who practice QHHT and those who do not, to inspire and assist in the healing of both Humanity and the planet, and maybe even beyond.